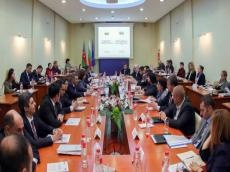 A delegation led by Azerbaijani Agriculture Minister Inam Karimov took part at the 5th meeting of the Joint Commission on Trade, Economic, Scientific and Technical Cooperation between Azerbaijan and Bulgaria in Sofia. Addressing the event, Bulgarian Energy Minister Temenuzhka Petkova briefed on the agenda of the meeting. The Bulgarian minister noted that the Bulgarian-Azerbaijani relations reached the level of strategic partnership. She stressed that Bulgaria supports the territorial integrity, sovereignty and immunity of the internationally recognized borders of Azerbaijan and spoke about the possibilities of developing mutually beneficial Azerbaijani-Bulgarian cooperation in the field of energy. Touching upon cooperation in the energy sector, Petkova said that it is an important part of the economic ties between the two countries. She underlined the importance of the Southern Gas Corridor initiated and implemented by Azerbaijan for ensuring European energy security. The importance of transporting Azerbaijani gas to Europe within the framework of this project and in this context, providing Bulgaria with natural gas via the Greek-Bulgarian gas pipeline was emphasized. In turn, Karimov pointed out that both countries closely cooperate within the framework of international organizations, Bulgaria constantly supports the fair position of Azerbaijan, based on the norms of international law, in the settlement of Nagorno-Karabakh conflict. During the meeting it was noted that numerous documents have been signed between Azerbaijan and Bulgaria in various fields, including in the economic sphere, and there has been a positive trend in the trade turnover. In addition, it was noted that there are great opportunities for expanding trade and investment cooperation. Then, there was another meeting between Inam Karimov and Temenuzhka Petkova. Speaking about the economic importance of infrastructure projects such as the Baku-Tbilisi-Kars railway and the Baku International Sea Trade Port, implemented as part of the economic reforms carried out by the head of state, Inam Karimov expressed the possibility of cooperation with Bulgaria within these projects. Later, a meeting was held between the ministers, during which importance of infrastructure projects such as the Baku-Tbilisi-Kars (BTK) railway and the Baku International Sea Trade Port, implemented as part of the economic reforms carried out in the country was discussed. Bulgaria recognized the independence of Azerbaijan on January 14, 1992 and the diplomatic relations between the two countries were established on June 5, 1992. Both countries are members of the Organization of the Black Sea Economic Cooperation (BSEC). The trade turnover between Bulgaria and Azerbaijan reached $37.43 million in 2017, $37.3 million of which fell on imports from this country, according to Azerbaijan’s State Customs Committee.